Graham Hill F1 World Champion Display. 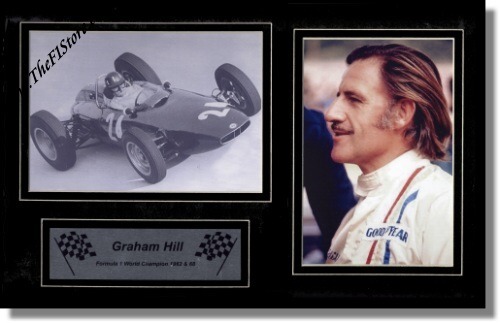 This Formula 1 display features a picture of Graham Hill in his race suit and one of him in his BRM P48/57 during the 1961 Italian Grand Prix at Monza. The piece is accented with a printed metal plate commemorating his 2 World Titles. The pictures and plate are finished off with a v-groove which is cut into the mount around them. It measures some 14 x 9.5 inches (or 35 x 24 cm in metric) and is ready for framing.